And Tell Me How This “Tax Reform” Makes Any Sense At All? The talk is all about how we need it to stimulate investment and therefore boost the economy. To this, I have one question: When is the last time you handed out money, no strings attached? If you want a particular result, you hand out the money with conditions. We call these “performance guarantees.” Look at any contract, you’ll see them there. Nobody in their right mind makes large financial commitments or investments without firm guarantees that their money will be dedicated towards producing the agreed-upon result. Author AllenPosted on November 27, 2017 Categories Current EventsTags Charity, GOP, Incentive, Investment, Performance Guarantees, Politics, Tax Cut, Tax Policy, Windfall6 Comments on And Tell Me How This “Tax Reform” Makes Any Sense At All? We will always need a viable, strong and thoughtful opposition in Congress, one that acts as a counterbalance to the excesses that will inevitably come if the majority party feels no need to seek consensus with others as it implements its own agenda. Sadly, the GOP is a sycophantic caricature of the great institution it once was, and is unable to be such a voice; and it may never be again if it continues on its present path. You know, while I am sure it is no surprise to my readers that I don’t agree with the Conservative Agenda (as presently conceived), and have never felt that Rep. John Boehner was a very effective Speaker of the House, I also recognize that Boehner was in an extremely difficult position: trying to hold together an increasingly fractious, extremist, and polarized GOP while simultaneously trying to make some sort of progress on many important issues. Not an enviable position; and he did far better in that thankless situation than most anyone else would have. So, rather than “piling on” and mocking or ridiculing him as he resigns from office and leaves Congress, I think it best to wish him well, and thank him for his dedication. I do worry, though – Boehner is the latest casualty in the GOP’s race to marginalize itself ever further from the American mainstream, alienating itself from most groups within the electorate in ways that will take decades to recover from, if they ever do. 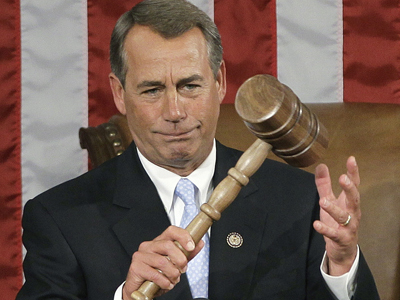 With Boehner gone, the Republican Party may well descend into chaos for a time. But whether it does or not, I worry about what the future will hold if they continue to reject the centrality of consensus-building within the political process.